Here I am, writing my monthly post. With each passing day I discover loads of topics to discuss, but find a lack of words to share my thoughts concisely. During the past few weeks Death has made appearances, work deadlines have been reached, and I have not met certain personal goals (the thank you notes and birth announcements continue to hound me). Though I am ever aware that being mother to SlytherBun (my new pet name for L created from my being a Slytherin in the Ravelry HPKCHC group) is my number one priority, I still want to be the bunny-rescuing, tech-savvy, gourmet-food-making, dart-throwing, fiber-crafty Superwoman that my BFF married on Veteran’s Day 2011. As BFF and I move onward in parenthood’s lessons, we were reminded that death is also a part of living when two beloved pets crossed over to the meadow at the Rainbow Bridge. One being “Little Man” Zydeco “The Angry Ewok” rabbit that was adopted 10 years ago from Sweet Binks Rabbit Rescue in Foster, RI. 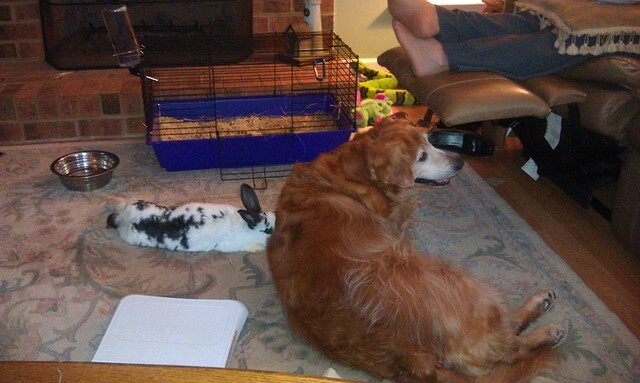 The other being “Honorary Bunny” Lily the “Best Golden Retriever EV-VAAA” who was BFF’s beloved canine sibling. Both of their passings were reminders to us that birth and death complement each other. We only hope that Lily reminds Sweet Pea (RIP February 2011) to share the carrots and bananas with everyone else in The Meadow. 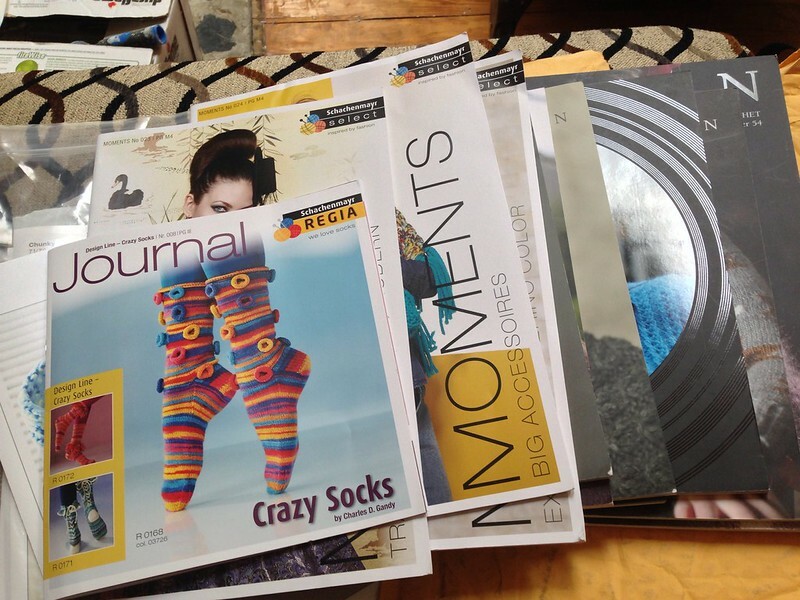 <3 [caption width="800" align="aligncenter"] Some of the latest Fall/Winter 2013 season from WFI[/caption]Work-wise, I have kept quiet on the subject except when asked directly or to explain to fellow crafters why I have stacks of fibery publications in my possession. For 18 months now, since leaving XRX and contracting with other companies, I have been mainly under Westminster Fibers as their Ravelry editor and working with other folks such as Kate Lemmers. The welcoming work keeps me in the fiber world’s loop since I cannot be there in person like I did when I lived in New England or worked for XRX. Recently WFI sent an extra copy of the North American version of Sarah Hatton’s “Scarves, Shrugs, and Shawls” to me. 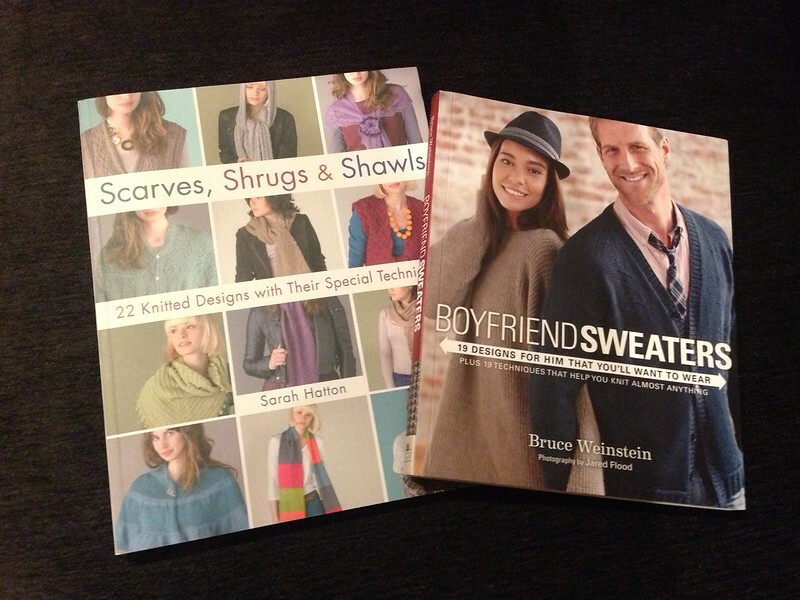 Not only that, but Bruce Weinstein was kind enough to send a couple of his autographed “Boyfriend Sweaters” books too! Reflection—–At the end of each day…whether it’s stressfull, busy or CrAzY…take the time to absorb all the little things that L acomplished or the special time you had together because before you know it she’ll be moving away from you to become her own person! My advice to you is to live in the moment. Dishes & laundry will always be around, but your lil one will only be little for so long. Treasure those moments, and remember them when they get older & can be more challenging. 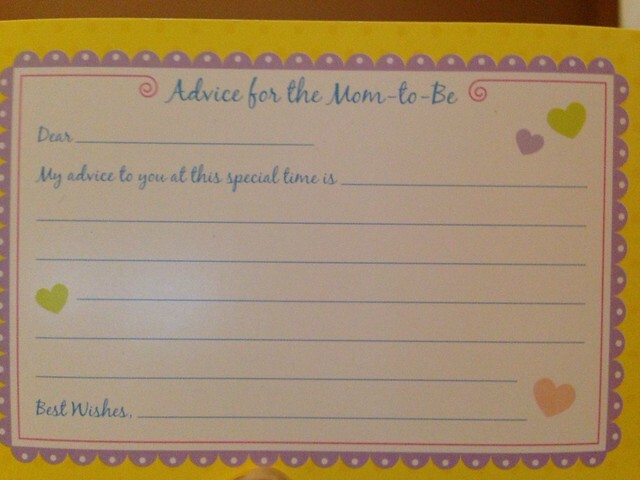 Well not being a mother myself I don’t know that I have much authority to offer advice. However, I have myself had parents once upon a time so hopefully that makes me mildly qualified to comment! Oh, and take time to knit things for yourself. L already has a well stocked wardrobe from what I’ve seen! My advice is to listen to your gut and to your little one. You know her better than anyone and she will tell you what she needs. Don’t base your decisions about dealing with your child on what you perceive others think you should do. Trust yourselves and be consistent. I agree with what everyone else has said. My advice would be to take time for yourself every day. Babies know when you’re stressed, and when you don’t get any “me” time, it can make it worse! Don’t be afraid to take a 2 min breather, even if she’s crying and you just need to walk away for a minute to compose yourself. It really helps sometimes! And when she’s older, don’t feel like you have to entertain her every second of the day. I feel like society puts a lot of pressure on women to be super moms and do it all and spend every second with or doing something with your kids. It’s good for them to learn to use their imagination, and play on their own too! And you shouldn’t feel guilty for having them go draw or play with blocks while you get to knit or whatever else it may be! Above all else, enjoy that beautiful baby you have, it really does go fast! When you have a really hectic day (teething is coming up pretty soon), order pizza and open a bottle of champagne instead of trying to cook dinner. 🙂 You and BFF need to remember to take time for your marriage no matter what else is going on. Date night every week is a must, even if it is just dinner and a movie at home after the kid(s) is(are) in bed. Thanks Cat! Last Saturday I ended up baking frozen pizza and serving it on china with a nice bottle of red wine. It made a fabulous date night! So very sorry to hear about the loss of your fur kids, Zydeco, Lily, and Julius. The most important advice I’d give has already been stated or said to you a million times. Enjoy each moment while your daughter is learning about her world. It’s crazy how the most trying times end up becoming the ones we look back on with fondness in later years. One day you’ll be teaching her to drive and you’ll have a flashback of the first carseat she sat in or how many years you spent buckling her in. Time flies when you’re watching your kids grow up. Anna, thank you. <3 I hope the little journal we are keeping holds those memories for us to share with her. Take time with your child/children, lots of time. Don’t worry about all the other “stuff”, children grow far too quickly & the time passes quickly! Enjoy the moments, live in today. Hold your child close, lots of hugs & kisses! Just love her, let her know and feel that she has the right to be here en to be who and how she is. PS: you may sigh and swear sometimes. Thanks, Inge! I so agree. As much as I would love to see her win the F1 championship, if she decides otherwise, she can. Shannon, thank you. Telling her “I love you” constantly is now on our “must do daily” list. I would love to win Scarves, Shrugs and Shawls! My advice as a mom, the advice I give other moms, is that you know your child better than any professional. Don’t let a professional determine how you raise your children. Listen your instincts. My advice is to enjoy each day as fresh and new. To quote Anne Shirley from Anne of Green Gables, “Tomorrow is a new day with no mistakes in it”.Be kind and compassionate to yourself as your family grows and changes. Karen, thank you. Those are good words to remember! Being a parent will have ups and downs. Things will always seem better in the morning. Try and relax and get some shut eye. Tomorrow will provide a solution to everything. Tina, good one! 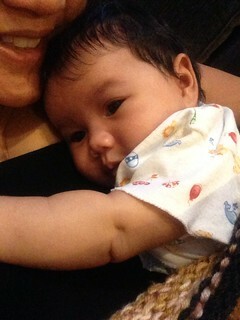 Hopefully we can get more rest after this growth spurt passes. Thank you! The best advice I can give is listen to your child. Play with them, read to them, and try and see life through their eyes. Let them know they can always talk to you without fear, and always give plenty of hugs and kisses! Linda, hugs and kisses are all aplenty, but listening is definitely something I want to do. Thank you! As for advice, well, advice is fine, but you are the one living your life. We all experience it and digest it differently. My time with my children was the hardest, most demanding and most cherished time of my life. My children are grown now, and I have two grandkiddos, that I cherish, and don’t see enough. I have a set of twins on the way, OMG. I can’t believe all the twists and turns my life has taken me on my journey. Marriage, pregnancy, labor, birth, birthdays, parties, walking the floor with colic, and the laughter and joys of children. Tears are also an every-day part of life. Children are born, pet family members pass over the rainbow, family members pass on to heaven. The joy and time of family has been my gift in life. Always wanted a family. Stand tall, let things come to you, rock your little ones. The housework and trivialities will wait for you. Your children will grow each moment, walk, talk and go to school. Do your job well, so they can grow and move into their lives completely and successfully. Life is a gift. Live you life with your children while you have time. Time is finite. There will never be enough. Best wishes, and hold your little ones, rock them and sing to them. There is always time for love. Thank you, Barb. BFF is amazed at how SlytherBun goes to sleep when I rock and sing to her. <3 We are determined to make her the priority. Her tears still make my heart ache though. I keep trying to kiss them away. As a mother of 2 grown daughters, my girls don’t cherish the clean laundry, the cute outfits, the meals I cooked, etc. they cherish the moments I put aside the duties of motherhood and just enjoyed the moment with them: an impromptu picnic, chalk-drawing on a sunny day, snuggling in bed watching a movie, etc. cherish the small moments and try to write down as many of these small memories as possible, even if it is just one or two words to trigger the memory later. Also, take time for yourself…you are so valuable to your children and they will benefit from the time you take to nurture yourself, as much as the time you nurture them. I do hope that pampering all three of us will be good. We are recording every possible moment we can of her, like learning to crawl and recognizing the bunnies. Thanks, Linda! Get to know your child for who they are; not who you think they are. Don’t try to be their best friend, but be a safe place for them to share all the things they think and feel – good, bad, or really ugly. Debbie, yay and thank you for that suggestion. I have seen other moms who get upset because their kids have no respect for them, yet these same moms have a relaxed attitude when structure is needed. You and your child don’t have to jump any hoops for anyone! *Grin* Thanks Louise! We are doing our best. I have always been a “pleaser” sort of person, so breaking that habit was difficult. When my daughter was 6 I was knitting her a sweater as a surprise in the evening after she had gone to bed. One night she said to me:Mommy I would rather have you read me a story than do” the surprise”. From that moment on I listened to her and what she wanted,not what I thought she wanted. Just listen to your kids and love them. They will surprise you. Your time is all they want.Let them know you are always there no matter what. Cindy, thanks for a great reminder. I have a tendency to anticipate/assume what is needed and is a damaging habit. breathe. and don’t sweat the small stuff! Chris…. Iiiiiiiiiiiiiiiiiiiiiiiiiin… Oooooooooooooouuuuuuuuuuuut!! 🙂 Thanks!! No matter how much a natural part of life death is, it still hurts. Hugs!! Favorite advice I read in the comments from a few folks: stick to your guns because you know your child better than anyone else. My advice: love your child enough to say no. Thank Chris! Your advice is something that I have been telling myself I will do when I have children. After seeing her face well up in tears when she wants something, now I can see why parents melt down and give in. Must.Try.Harder.to.RESIST! Boy, since I was never a parent, this is a tough question…but here’s some advice from a former teacher… Read. Read a lot. Read *to* her, read *with* her, read *around* her. Make sure she has books, and put them on a shelf near the floor…she has to be able to get her hands on them, and sooner rather than later. Saddest thing I’ve ever seen was a child’s books stored on a high shelf “because he kept taking them down, and they were messy.” Find some favorites that you’ll read over and over–I had one of nursery rhymes that everyone swore I could read at a young age because I could turn the page and “read” the rhyme. I couldn’t, but I had heard them so often that I had them memorized. Reading and books will pay you all back forever in many ways. MaryAnne, thank you! So cool to see that I did good on your advice so far. I had requested certain books to read to/with her, and sing all sorts of nursery rhymes and children’s songs to her daily. I hope I am on the best track! My only advice to you is to just enjoy every single moment of mommy-hood to the fullest! Coming from a mommy of two, I can tell you that they are only babies for what seems a moment. A child holds our hands only a short while. But a mommy holds their hearts forever! Christine, we will! Thank you!! relax, breathe, take 10 minutes to give the kids to hubby and take a nice lavender bubble bath. Do what you want to do for just a tiny bit, 5 minutes of knitting or whatever. Good luck and best wishes to you and your husband and a happy life and family. Oh gosh, thank you for reminding us. My BFF is the most wonderful husband and father. As soon as he comes home from work, he takes care of SlytherBun because I have been with her all day. Besides the lawnwork, repairing/maintaining the house/cars, he also does all of the cleaning and laundry. But we definitely will take some time out for ourselves, promise! There are going to be lots of questions…answer them…no matter how many they ask!! This will let them know they can always come to you with whatever is going on in their lives, good or bad! !